This funny shark card by Naki today will definitely put a smile on your face! She started out by coloring a cluster of sharks from our big Shark Frenzy Stamp Set! This set has a whole panel of sharks to fill your card front but for this card, Naki colored and fussy cut out just a small section of the large image to add to her card! This is a great way to get more use out of those big images! Once her sharks were ready to add to her card she layered them with several layers of waves that were cut out of vellum using our Sea Borders Die Set. She added a pop of red with a tiny hear and a bow tie on the shark in the center! Both of these shapes were created using our Papa Bear Stamp Set and coordinating Die Set. Isn't that bow tie on the shark so cute!? 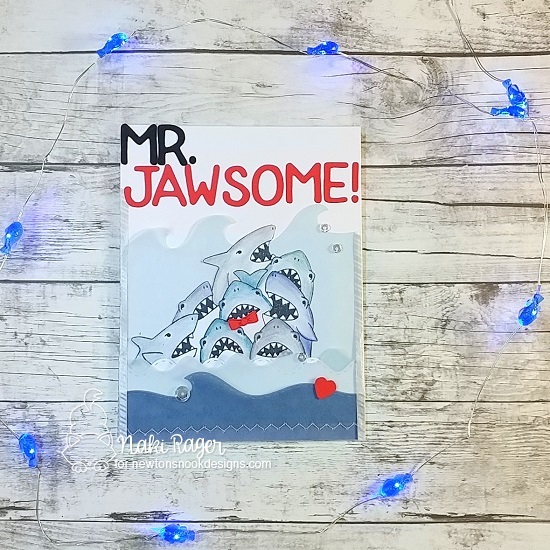 Then, she finished her card with a custom "Mr. Jawsome" Sentiment, created using our Essential Alphabet Die Set. Thank you for the smiles today, Naki! If you like this project you can see more of Naki's work you over on her blog, Notes from Naki. Stop by and say hello! The pop of red is so perfect on this amazing card!! !